Heavy duty railway wheels of different dia 26", 27", 32", 36', 38", 42" etc. We supply all types of Railroad wheel sets Freight Wagon & Passenger Coach with or without sub assemblies and fittings, brake discs, bearing, axle boxes etc. We are one of the trusted companies of Railway Wheels. Our products are enormously admired in the market owing to their top features. Can provide you for round and flat guide rail also. 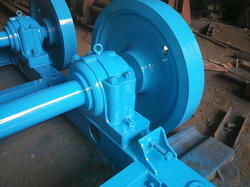 We are offering Railway Wheels used in spinning machine for making P.S.C pipes. Our range of Railway Steel Wheel is widely appreciated by our clients which are situated all round the nation. 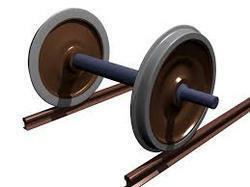 We offer our range of Railway Steel Wheel at most affordable prices. We are highly engaged in manufacturing an extensive range of Railway Wheel. These products are manufactured with the guidance of experts in compliance with global guidelines. Available in different shapes and sizes, our products are finely finished. Our products are available in market at very competitive price.